The University of Alabama Department of Art and Art History is pleased to announce Heather Leigh Whidden’s MFA thesis exhibition, Re(pair), April 1-29 in the UA Gallery at Dinah Washington Cultural Arts Center. There will be a reception Friday, April 1, 5-8 pm (First Friday). The public is cordially invited to attend. Pensacola native Heather Whidden received her BA with a concentration in studio art from the University of West Florida. 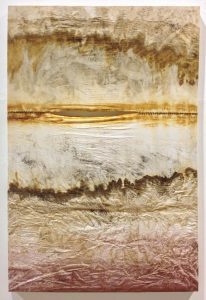 During her candidacy for MFA at the University of Alabama, she has taught and assisted classes in 3D design, sculpture, ceramics and painting. In February 2016, Whidden presented her paper, “Interpreting the Stitch,” at ACS Gender Studies Conference at Southwestern University, Georgetown, TX. The Dinah Washington Cultural Arts Center is located in downtown Tuscaloosa on the corner of Greensboro Avenue and 7th Street, across from the historic Bama Theatre. The DWCAC’s hours are Monday through Friday, 9 am – 5 pm and First Fridays, Noon – 8 pm. Image credit: Heather Whidden, In the Being from Within. Image courtesy of the artist.